Not too long ago, face book was buzzing with pictures of the Fon of Mankon, HRH Angwafor III. The picture raised a lot of eyebrows. Was it because he too decided to join this number one social networking site? Apparently or better still, not in the way we might think. His picture was making the rounds for obviously different reasons. 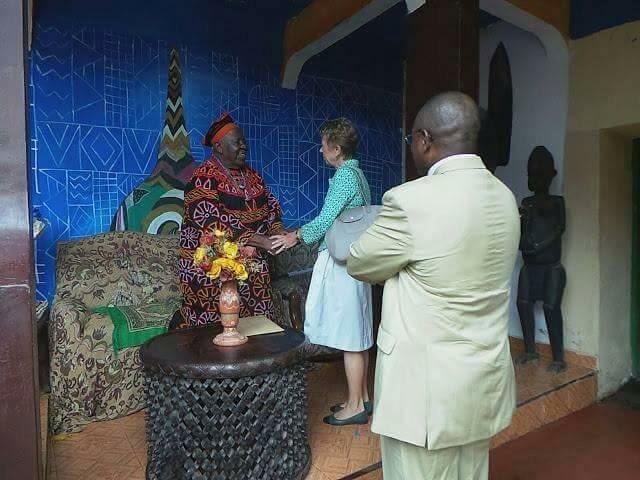 In the picture that was circulating, he was shown to offer what has become an infamous handshake to the French Ambassador to Cameroon visiting his fondom. Another seeming violation of tradition was said to have happened in the West Region by same ambassador. I am sure everyone reading this is wondering why a simple gesture as a handshake could cause such uproar. Well, one of the traditions of the people of the North West Region is that the Fon is forbidden to shake hands with anybody. It is difficult to pinpoint exactly why such a tradition is put in place. However, pundits hold that it all stems from superstition and fear of the unknown. Fear that someone with evil intent may harm the fon through black magic with a simple handshake. How true this is everyone’s guess. The fact however,remains that it is taboo for any fon to shake hands with people. This belief is widespread in the North West Region and some tribes in the Lebialem Division of the South West Region. Everyone must prostrate themselves before the fon as a customary way of greeting. Being the custodian of all the traditions and someone the people place akin to a god, the fon is equally expected to be the one to uphold such traditions. His standing and extending not only one but both hands to the visiting French ambassador was seen as a kind of sacrilege. And thus the questions started coming out. Was the fon being overly polite? Was it time to do away with this particular tradition? If so why did he choose a foreign dignitary to set the pace? Why did the ambassador not follow the same rules like every other person or was she exempted by virtue of her skin colour? A lot of unanswered questions with some people bearing grudges against the fon for ‘selling’ his people short yet again in front of a white man. As we move with changing trends, it is a given that some traditions will have to give way or find a balance with modernity. Nevertheless, the way it is all done will determine the readiness with which the people embrace this change to what has been a long held cultural belief and identity. The debate may have died in some circles but in others; it is still raging on, which brings us back to our topic: Was the Infamous handshake an aspect of tradition giving way to modernity? Or is it another facet of our rulers and representatives discarding what we hold dear and selling us short again and again? Your Comments inspire me. Please read and drop a line, thank you. (Pic credits published with permission). Prev Is CANCER The New Silent Killer? Next Empowering Warriors: Sickle Cell Clinic Goes Operational At the Etoug-Ebe Baptist Hospital. The thing is if they impose something like tradition, they should equally uphold it. Thank you dear. Always great to see your presence here.